Are you having headache on what to wear for engagement photo session? 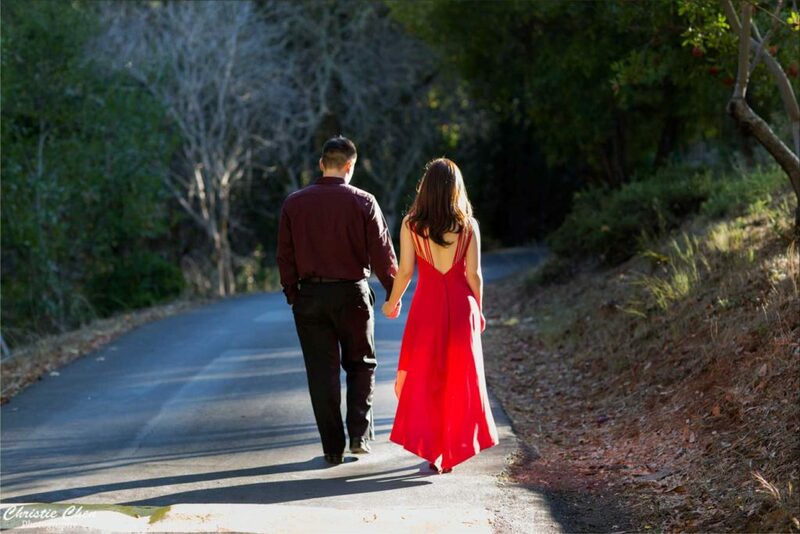 We have some professional engagement photography wardrobe tips for you. As a couple, your outfit colors need to complement each other, but not match exactly. If you both wear the same color palette, the photo may end up look unnatural and flat. Bold colors are recommended, but with right styling , neutral colors can also work just as well. If you prefer neutrals, find statement pieces that are rich in detail and add color with accessories. A color pop pair of shoes, piece of jewelry, or lipstick can sometimes be all you need. Also if one person is wearing a neutral palette, the other person can wear a bolder color palette for contrast. .Accessories: Don’t forget about the finishing touches, in addition to colors and details, accessories will complete your outfits and also make each other’s outfits cohesive. For women, jewelry can often tie an entire outfit together. but the focus should be on the engagement ring. Avoid wearing additional rings, and if you choose to wear bracelets , wear them on the opposite hand. For men, a tie, or bowtie is a great way to accessorize and tie in the colors that you choose. Play with additional accessory options, such as detailed belts, printed scarves, tights, and hats, but make sure you don’t overdo them. Too many accessories, like too many prints, will disrupt the balance of your photos. For example, if you opt for a hair clip, wear dainty earrings and skip the necklace or vice versa. .Styling: With locations, colors, details, and accessories in mind, it’s now time to put all pieces together. The most important words are layers and balance. Layers give you outfits dimension, and they are an easy way to add color, texture, and different outfit options too. When putting your outfits together, women have tons of creative options. You can add outwear such as a knitted cardigan, a bold colored coat, or a shawl, to completely transform an outfit. You can also try different layering techniques, such as a top over or under a dress,. for example, a sheer lace or crochet top over a dress and a belt at the waist will create the perfect balanced outfit. A peter pan collared blouse or a button-up collared blouse layered under a dress is a cute options too. Both outfit will create the perfect lance of texture and interest. For men, layer a smart blazer, a textured cardigan, a tailored jacket, or a vest over a simple tee for a complete look.You can also layer a button up collared shirt underneath a crew or v neck sweater for effortlessly style. Another favorite combination is a collared shirt underneath a blazer for a casual, yet put together book. With menswear, it will be easy to mix and match all the pieces for different options.